New Delhi, February 15: The Enforcement Directorate (ED) on Friday attached assets worth Rs 4.62 crore of a firm linked to Robert Vadra, Congress president Rahul Gandhi's brother-in-law and Priyanka Gandhi's husband, in connection with the Bikaner land scam case. Robert Vadra Leaves ED Office After Seven Hours of Questioning on Day 2, Priyanka Gandhi Picks Him up After Interrogation. The firms whose assets have been attached by ED are named M/s Sky Light Hospitality (P) Ltd (Now LLP). Robert Vadra, Maureen Reach ED Office in Jaipur For Questioning; Congress Supporters Raise 'Priyanka Gandhi Zindabad' Slogans. 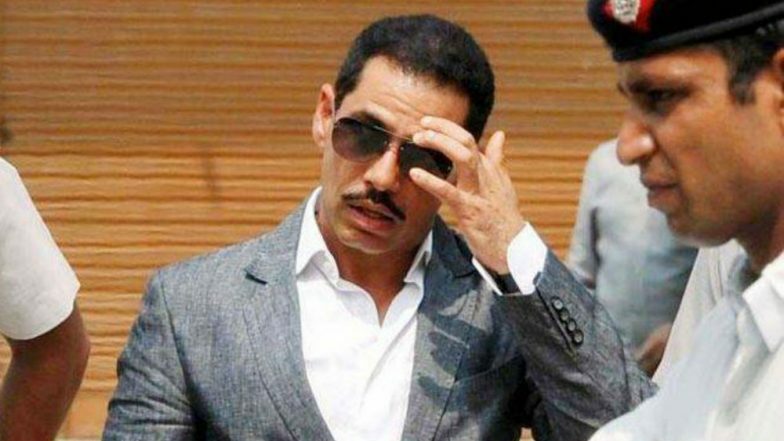 "The attached assets include movable assets amounting to Rs 18,59,500 pertaining to four individuals and one immovable property situated at 268, Sukhdev Vihar in New Delhi to the extent of Rs 4,43,36,550 owned by Robert Vadra's company Ms Sky Light Hospitality (P) Ltd (now LLP)," the agency said. On Tuesday, Vadra and his mother Maureen had appeared before the ED in Jaipur. Congress general secretary and Vadra's wife Priyanka Gandhi had accompanied them to the probe agency's office. Robert Vadra has been on ED's radar for almost a fortnight now. On February 7, 2019, after seven hours of questioning by the Enforcement Directorate (ED), businessman Robert Vadra left the probe agency's (ED) office at around 9 pm. Vadra was grilled for the consecutive second day in connection of money laundering case and illegal foreign assets cases. The Congress and Robert Vadra said that the ED questioning was done at the behest of the government in power and called it a case of personal vendetta. When asked by reporters recently, Priyanka Gandhi Vadra said, Congress general secretary for Uttar Pradesh east, said, “I am not affected by all that. I am doing my work.” Priyanka added that she is “grateful” of the Congress workers who waited outside the party office for her in Lucknow. Priyanka further said that she is “learning” from the Congress workers about local level party administration.